I threw together a little pincushion for BoogaJ’s Pincushion challenge. It is made out of felt and stuffed with yarn scraps that I was happy to get rid of. I guess i could put up the pattern too… Anyone interested? 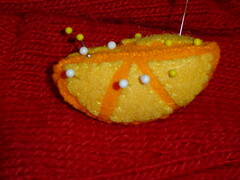 3 Responses to "Orange Wedge Pincushion"
Sweet pincushion. Love it. but now I want an orange. Well as long as someone is interested, I will work on that pattern!